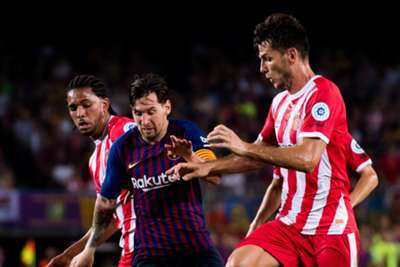 LaLiga president Javier Tebas insists he has no plans to propose an alternative regular-season match in Miami next month after Barcelona pulled out of their proposed contest against Girona. The prospect of playing a LaLiga game in the United States had been roundly criticised, with the Royal Spanish Football Federation (RFEF) and prominent players such as Barcelona defender Gerard Pique voicing their concerns. In October, FIFA president Gianni Infantino said world football's governing body would not sanction the contest, which was proposed as part of a 15-year agreement between Spain's top flight and Relevent Sports. On Monday, Barca withdrew from the planned match at Hard Rock Stadium, "after noting a lack of consensus over this proposal". "The calendar was already established for a long time. There is no plan B," Tebas told AS. "We already said that it was a voluntary issue. We are going to try and change the opinion of Barcelona. "It is a very thoughtful decision of [Barca's] board of directors." Tebas explained he was yet to discuss the matter with Barcelona president Josep Maria Bartomeu and thanked Barcelona for allowing the process to get so far down the line. "I do not consider it a betrayal," he added. "This was voluntary and until the last moment I could make a decision like that. "Barca wants unanimity and that will be very complicated. I can only thank them for helping us."